Most everyone knows the differences between desperately struggling to stay hopeful around energy vampires and that glorious feeling of being uplifted when you are surrounded by loving, nurturing people. In both cases there is a cause and effect cycle that once understood, can either be broken or reinforced depending on if you want to feel peaceful & loving or angry & frustrated. Whichever we choose, determines whether our own vibration goes up or down. 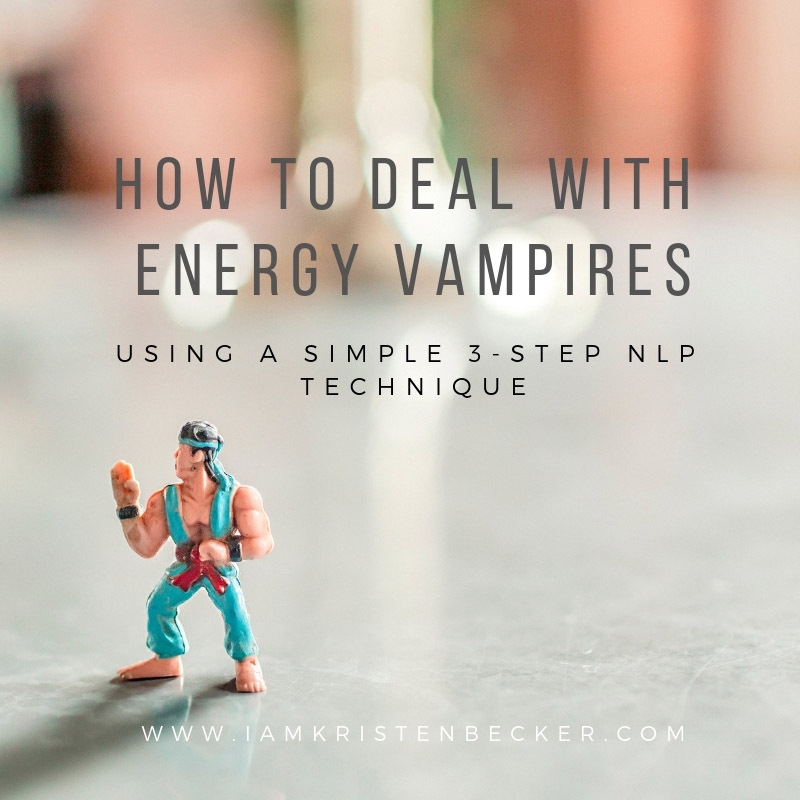 The trick is in understanding how emotional energy affects us and learning how to deal with energy vampires. We naturally know that we want to keep our own vibrations high, it just feels good! Our own vibrational energy pattern also contributes to what we are attracting through the law of attraction so of course, we want to keep our energy vibrating in a high place too. The good news is that everything begins with you! It’s extremely helpful to understand our own energetic vibrational patterns. How are they formed and how do they affect our lives? How do they empower us to have more creative control and input into our own manifesting process and day to day peace and happiness? How does this understanding help us to deal with people that we perceive as energy vampires? Your vibrational energy patterns are one part of a dynamic whole. The vibrational energy pattern that we choose to engage with plays an important role in our overall happiness, our ability to achieve, move forward, have healthy relationships and the ability to have a sense of peace in all of life’s dynamic experiences. It’s vital that we keep our own emotional energy levels high and in check! Check out this video to learn more about how your emotions are creating your own vibrational energy patterns. If you have or have ever had an energy vampire draining and effecting your own emotional energy, I have great news for you. There is no such thing as an energy vampire. I know, everyone loves that catch phrase “energy vampire” and I’ve used it myself but the fact of the matter is that there is no such thing. 1. Everyone is doing their best for wherever they are right now. Including you and me. What we may perceive as someone’s negative energy, is really just their own struggle (with what we may or may not ever know) to free themselves of that negative energy state and move on up the emotional/vibrational scale to love and acceptance. Their goal is not to take your energy but simply to raise their own- help a brother out. 2. More often than not, none of the low vibrational fear based energy/anger/emotion that is being projected toward you has anything to do with you. Think about their perspective, experiences, hopes and fears and what other things might be playing into the situation and fueling their low vibrating energy. 3. Oh wait, it might actually be you. We all do things from time to time that invite low energy right back to ourselves without even realizing it or taking responsibility for it. Our own emotions are boomerangs- we get back what we put out. 4. We get to choose whether or not to internalize and participate in the emotions and corresponding negative energy that is going on around us. Yeah, I know, this is the hard part but keep reading- I got you. Not being able to make someone else out to be the big bad energy vampire and the source of our own low energy and negative emotions is the best news ever! It means that we each have, within us, the complete and total ability to maintain the emotional/vibrational energy levels (and awesome feelings & experiences that go along with them) that we want. Sure, life and the people in it, can present us with challenges as well as unique and sometimes less than comfortable, opportunities to grow at times. But it’s through those challenges that we grow, evolve and become more and more self-actualized. O- Ownership- Ask yourself, “do I want to take ownership” of the negative emotions and energy that is being projected here? Once we choose to take ownership, that emotion will drive the experience moving forward. “hurt people hurt people”. For example, my child might lash out in anger and frustration. I still need to work through the situation but choose to do so without also taking ownership of those feelings and joining in on the emotionally fueled and directed roller coaster. We do not have to take ownership of and join in on feelings, conversations, actions, life choices etc. To each his own, we just don’t. Ownership of someone else’s emotions is your choice. We have two choices here. One is to not accept the low emotions and offer love, compassion, and acceptance. I know when I’m being an A-hole this changes my tune real fast and I’ve seen this happen many times on the giving side as well. 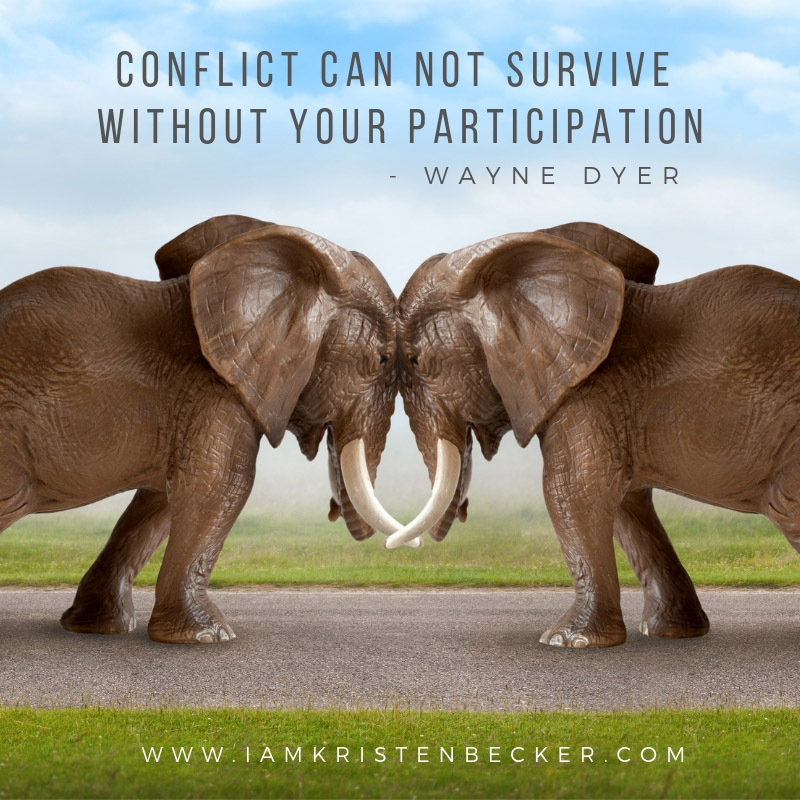 Also, we can choose to compassionately disengage, at which point the other person will move on. Having thrown the old tug of war rope and received no tension in return, they will move on. W- Why? – ask yourself “why is this person feeling this way and why am I feeling the response that I am feeling?”. Both often have little to do with the situation at hand. We all bring to the table, life experiences and context that contributes to how we see and react to things. Being able to see the perspective of both people more clearly creates some wiggle room for you both to be a little more human and the ability to allow compassion to fill the space between you where anger once was. N – Need- ask yourself “do I need to feel this emotion”. Spoiler alert- the answer might be yes! If you think about the scale of emotions, the objective is always to move up and not down the scale, raising our own vibrations. Lower emotions are our own inner guidance system, alerting & prompting us to move further along up the scale. For example, anger might lead us to pride which could lead to courage and taking a needed action and then the self-esteem that goes along with that and so on, helping us to gain skills and insight that we get to keep forever. (thank you very much energy vampire!). See how I brought this all home here? Now we are grateful to the energy vampire for presenting us with an opportunity to continue to move up the emotional scale, become all self-actualized, raise our own vibration and stuff. And then (if you watched the video!) you know what you will attract more of into your life. O.W.N. it.